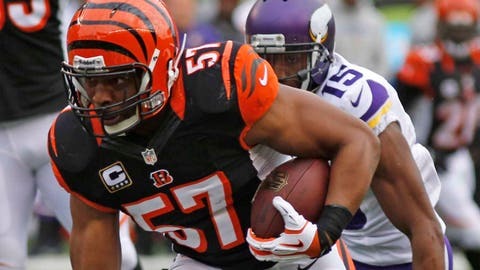 Cincinnati Bengals middle linebacker Vincent Rey returns an interception against Minnesota Vikings wide receiver Greg Jennings (15) for a 25-yard touchdown in the first half on Sunday, Dec. 22, 2013, in Cincinnati. The Bengals have won the AFC North and the right to host at least one playoff game. The Ravens come to Cincinnati next week trying to keep their playoff hopes alive — and maybe book a return trip on the first weekend of January. 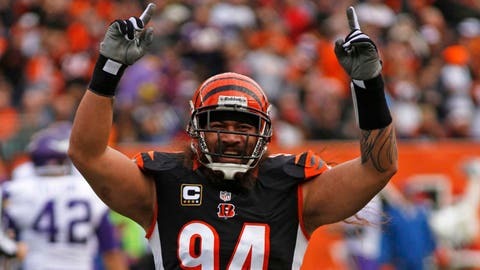 The Bengals currently hold the AFC’s No. 3 seed. The 8-7 Ravens are battling with 8-7 Miami, 8-7 San Diego and 7-8 Pittsburgh for the AFC’s sixth and final playoff spot. The third-seed will play the No. 6 in the wildcard round. The Bengals can still be the No. 2 seed if they beat Baltimore next week and New England loses to Buffalo. The Bengals can still be the No. 4 seed if they lose to the Ravens and the Colts win. The Ravens win a head-to-head tiebreaker in a two-team tie with Miami and a conference record tiebreaker in a two-team tie with San Diego. The Dolphins win a three-way tie, as well as a two-team tie with San Diego. The Steelers get in by beating the Browns Sunday and having the Ravens, Dolphins and Chargers all lose. In a four-way tie scenario, the Steelers would win the tiebreaker — and, like the Ravens, could be in Cincinnati for an all-AFC North wildcard game. Kansas City is going to be No. 5 as the first wildcard, but that’s all that’s settled heading into the season’s final week. Denver is 12-3 but would lose the No. 1 seed with a loss next week and a Patriots win. With a Bengals win, Cincinnati would be no lower than No. 3.